Fall would not be the same without the Kendallville Apple Festival in Indiana, the heart of the heartland. Whitt claims the best part of his boyhood was spent outside Terre Haute, so he’s part Hoosier anyway. This year for Kendallville he set to music a James Whitcomb Riley poem, The Raggedy Man. Go to www.kendallvilleapplefestival.org and check out this growing event. Here we are, all dolled up for the event, performing on one of several stages around the fairgrounds. 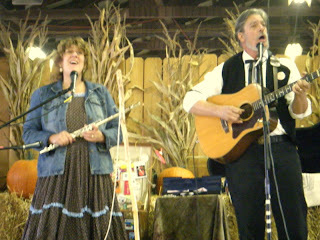 This is a view of the same stage as our friends (and accomplished artists) Jim & Suzanne click here performed. We also played the "Prairie Stage." a larger stage with bleacher seating. It was kind of hectic there, so we didn't get any shots of that.